Several Republican lawmakers were evacuated from a GOP trainwreck Friday afternoon after the Bush Presidency derailed. The administration came off the track just before 9:30 Friday morning near the Union Station on Massachusetts Avenue, NE near Columbus Circle in Washington, D.C. According to the RNC, it was caused by an Bush's fixation on Iraq, challenges from an opposition Congress, and defeat on immigration, his last major domestic priority. Officials say the evacuation was just a precautionary measure. "The General Chairman, Sen. Mel Martinez, came up to me, and said I had to hightail it outta there because Bush was 'off the tracks,'" said Sen. Susan Collins of Maine. "It ruined my dinner plans," said Sen. Pete Domenici. "I didn't have time to freshen up or anything." No GOP lawmakers were reported injured. 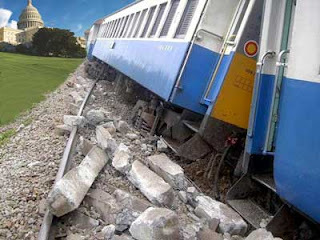 The causes of the derailment are under investigation by Democrats in congress. Train service between Dupont Circle and Union Station was briefly disrupted.